When my dad was a kid, he was able to watch the Beatles on their much lauded Ed Sullivan appearance. My own childhood Beatles moment came with the broadcast of Anthology in 1995, a documentary that recounted the band’s history up through their breakup post-Let It Be. Although my parents didn’t play much pop music in our house, I was surprised by how many of the songs that I actually knew and liked. 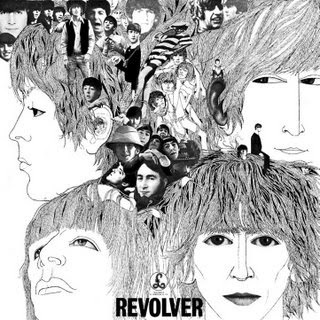 I decided then to try to dig deeper into their catalogue, and lacking any sort of authoritative or context, I arbitrarily decided to start with Revolver. Listening to Revolver the first time in about seven years, I was struck by how many times I actually laughed out loud, thinking, “Well, here’s yet another great song.” "She Said She Said"and "And Your Bird Can Sing" are not what I remembered from this album, and probably haven’t even heard in any other context like in commercials or the radio, but still surprised me with how absolutely great they are. Another highlight is Harrison’s "Love You To", which frenetically builds across a sitar backing that sounds exotic, but is firmly anchored in a pop sensibility. Hell, even "Doctor Robert" is catchy, fun, and cool. All of these tracks, however, are just build up to the stunning closer "Tomorrow Never Knows". When I first heard it in 1995, it sounded like it had freaking landed from space (and indeed, I used it in the background of a crude film about alien invasion). Even today, it sounds positively futuristic. The backwards loops, distorted strings, loving crude guitar solos, up-tempo, unrelenting beat, and bizarre, tripped-out lyrics, (e.g. “Turn off your mind, relax, and float downstream,”) create a kind of sonic wall send straight from the 7th dimension to completely envelope and take over the listener. It is as indulgent as the previous sentence, but with better structure and sense of composition. Taken as a whole, Revolver sounds both familiar and progressive. And it absolutely rocks.